You haven't been to KL if you haven't visited the Golden Triangle, which offers the best of the territory's retail, dining, entertaining and other commercial outlets, including boutique hotels. And the centre of the Golden Triangle is Star Hill, or Bukit Bintang (prime area), lying northeast of the Kuala Lumpur City Centre. Its major streets Jalan Bukit Bintang, Jalan Imbi and Jalan Sultan Ismail are lined with shopping malls, large five-star hotels, smaller boutique hotels, and corporate office buildings. 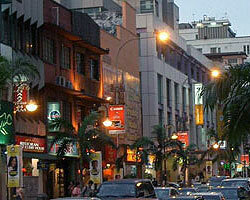 Bukit Bintang is ever-bustling day and night, especially on weekends and holidays. Aside from nightclubs, it has a lot of cafes and outdoor mamak stalls, many of them open 24/7, offering the best of local food and drinks. It's easy to get here by high-speed monorail, LRT, taxis and buses. There are many residential condominiums and serviced apartment buildings in Bukit Bintang. Ampang is a major expatriate hub, with exclusive residential neighbourhoods and elegant condominium buildings. Wealthy locals, mostly Chinese and Malay, live here, many of them working for the national oil company, Petronas. Ampang also features the best international schools and medical facilities in Malaysia. There are many Malaysian, Korean and Western restaurants in Ampang, but the neighbourhood is most famous for yong tau foo, a Chinese soup heaped with vegetables and stuffed tofu. Those who want to try the area's signature dish can try any of the popular eateries near the police station. Formerly a mining town where many of the country's tin barons resided, Ampang is split between the federal territory and the Selangor state. Ampang town proper is within the Kuala Lumpur territory, while Ampang Jaya is the portion under Selangor state. KLCC is the capital's commercial heart, spanning 40 hectares and centred on the majestic Petronas Twin Towers, the world's tallest twin buildings. Tower One houses the offices of the national oil company, Petronas, and their related businesses. Tower Two is leased to multinational firms such as Microsoft, IBM, Boeing, Reuters, Bloomberg and Al Jazeera. Beneath the towers is one of Malaysia's biggest shopping centres, the Suria KLCC Shopping Mall, which features a good variety of retail, dining and recreational outlets. The Malaysian Philharmonic Orchestra is also housed here. Another famous landmark is the KLCC Park, a beautifully landscaped 20-hectare oasis with children's play areas, musical fountains and jogging trails. This park is one of the final works of the late Brazilian landscape artist, Roberto Burle Marx. KLCC also has upmarket residential towers, with a significant expat community, and there are still several on-going real estate development projects designed for luxurious urban living. Many are serviced apartments in various sizes, and depending on the location, provide stunning views of the cityscape or the distant mountains of Genting Highlands. The five-storey KLCC Convention Centre, Malaysia's most modern conference and exhibit venue, is also located here, which also hosts the huge indoor aquarium, Aquaria KLCC. The 11-hectare Bukit Nanas Forest Reserve provides a breath of natural tropical greenery to KLCC is, the only remaining rainforest in the urban centre of Kuala Lumpur. Its entrance is just beside KL Tower. Ampang Hilir's main road, Jalan Ampang Hilir, is also called Embassy Row, as it is lined on both sides by foreign embassies and consulates, some housed in stylish mansions that were once the homes of Malaysia's tin barons. A prestigious neighbourhood, a sanctuary from the urban bustle, Ampang Hilir is a secluded, tree-lined enclave. It's popular not only because it is near KLCC, but also for its lush and serene atmosphere. It is full of colonial-era buildings, luxury hotels, elegant private dwellings and low-density residential complexes. One sought-after location is the minimalist-designed apartment complex Seri Hening Residence. The shops in Ampang Hilir are oriented to its very cosmopolitan, well-off population of foreign residents, including ambassadors and other diplomats. Groceries such as the Hock Choon Supermarket stock imported items rarely found elsewhere. Some international schools are just a stone's throw away from the residential neighbourhoods. The private Gleneagles Medical Centre, set amid landscaped gardens, is one of the most modern medical facilities in Malaysia. One of the best addresses in Malaysia, the tranquil yet trendy Bukit Tunku (once known as Kenny Hills) includes the neighbourhood of Taman Duta. Kenny Hills was already an enclave of first-class private homes in gated subdivisions during the colonial era. Today, Malaysia's wealthiest live in a secure, guarded community. There are great views of the city, and the lavish mansions are set amidst lush, hilly terrain. This low-density area is purely residential. There are no commercial establishments, only low-rise luxury developments, and not very many of those. Not surprisingly, real estate prices are high. Taman Duta has a 104-hectare botanical garden, the 19th-century Lake Gardens, with one of Asia biggest bird parks as well as two natural lakes. Its landscaped grounds also feature a deer park and butterfly park. There are playgrounds, exercise venues, jogging trails and rowing areas. For dining and nightlife, residents go to the restaurants, cafes and clubs in nearby upscale areas such as KLCC, Damansara Heights, Bangsar and Sri Hartamas. Another of Ampang's elevated residential areas, Ukay Heights has a calm, suburban ambience. Its hilltop bungalows nestle among mature trees and enjoy a great view of the Klang Valley. The upscale developments here attempt to have a low impact on the lush natural surroundings. They are mostly low-rise and low-density complexes, with one project, Maple Homes, totally refurbishing old units built in the 1970s, keeping the colonial-inspired architecture, yet adding modern amenities such as lifts and sliding doors. Popular among expatriates, Ukay Heights is a 15-minute drive from the city centre, while the Kuala Lumpur International School is rather near. It is also home to an exclusive leisure club, Kelab Darul Ehsan, which has a 9-hole golf course, driving range, swimming pool, tennis courts and other sports facilities.